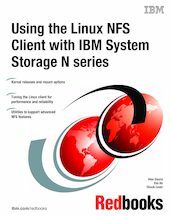 This book will help you get the best from your Linux NFS clients when used in an environment that includes IBM System Storage N series products. It begins with a general discussion of Linux distributions and kernels, and includes a comparison of some of the features of the 2.4 and 2.6 kernels. A detailed discussion of mount options and network protocols is presented to guide you through configuration tasks. Procedures for tuning your Linux clients and steps to diagnose performance and reliability problems are presented, along with information about additional resources you can consult if necessary. Finally, steps for configuring and using utilities that support advanced NSF features are provided. This document is appropriate for customers, systems engineers, technical marketing engineers, and customer support personnel who install and configure Linux systems that use NFS to access N series systems and network caches.